​Communitech is encouraging K-W’s burgeoning tech sector to give back this holiday season by creating a Holiday Giving Guide that covers everything from donating time or money to goods and skills to those in need. 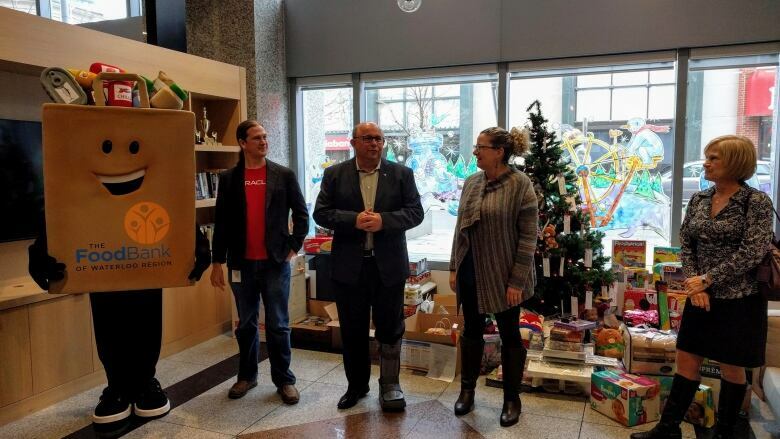 Communitech is encouraging Kitchener-Waterloo's burgeoning tech sector to give back this holiday season by creating a holiday giving guide that covers everything from donating time or money to goods and skills to those in need. It's the second year in a row the group has created the guide, in part to help encourage the tech sector to become more involved in the community. "We have a really different kind of ecosystem here. It's a lot about building up the region. In other kinds of tech eco-systems, it's just been about just success – financial success, at whatever cost," said Beisan Zubi, Communitech's community relations manager. "We have a lot of founders here who have actually been to Silicon Valley and seen what happens – like what the negative side effects of unmitigated growth and gentrification that leads to inequality and to unaffordability [are] and they don't want that happening in their home." Zubi said the season started off with "Toasty Toes," which is a drive for socks for people who are homeless. "A bunch of tech companies raised thousands and thousands of socks," said Zubi. "TextNow, one of our Communitech member companies, they work with cellphones. They raised 4,000 socks and then they also donated cellphones to those people as well. Those help people get jobs [and] be able to have a return phone number on a resume." Zubi said companies at different stages find different ways of giving back, including volunteering. "Another resource that they have is space, so we've been seeing a lot of … if a charity needs to have a board meeting, having it in a tech company's offices and then kind of donating that space," said Zubi. Communitech also highlighted team activities that people can volunteer as a group for. "There's so many different ways to get involved and sometimes that can seem overwhelming," said Zubi, adding the guide is a way of simplifying and streamlining the process of getting started on volunteering. The holiday giving guide can be found here.